Power Star Pawan Kalyan, chief of Jana Sena for all his love for Che Guevera is extremely spiritual. Currently he is on a state wide tour of Andhra Pradesh and in between he has been taking various breaks. Rumors also spread that Pawan performed some tantric rituals too. Now, it is coming out that Pawan will soon be on chaturmasya deeksha. 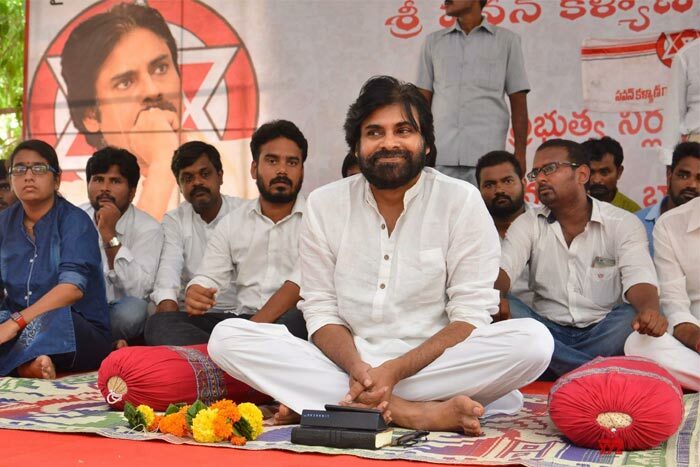 Pawan has been undertaking this deeksha every year. On the eve of Navratris starting from Oct 10, Pawan after performing rituals in the presence of Goddess Kanakadurga in Vijayawada will undertake deeksha for 9 days. Pawan Kalyan will be having only fruits and milk for the upcoming 9 days and on Vijayadashami end his deeksha. Pawan who met his party leaders in Polavaram revealed his decision to them. However Pawan will not take break from his yatra during his deeksha. He is all set to organize Jana Sena Kavatu on Dowleswaram bridge on Oct 15. Will Super Star Support Him?